For other uses, see Blackburn (disambiguation). 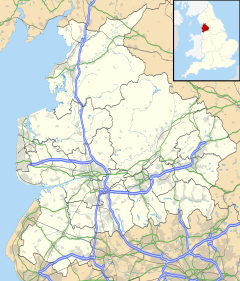 Blackburn /ˈblækbərn/ ( listen) is a town in Lancashire, England. It lies to the north of the West Pennine Moors on the southern edge of the Ribble Valley, 9 miles (14 km) east of Preston, 20.9 miles (34 km) NNW of Manchester[n 1] and 9 miles (14 km) north of the Greater Manchester border. Blackburn is bounded to the south by Darwen, with which it forms the unitary authority of Blackburn with Darwen; Blackburn is its administrative centre. At the time of the UK Government's 2001 census, Blackburn had a population of 105,085, whilst the wider borough of Blackburn with Darwen had a population of 140,700. Blackburn had a population of 117,963 in 2011, a massive increase since 2001. A former mill town, textiles have been produced in Blackburn since the middle of the 13th century, when wool was woven in people's houses in the domestic system. Flemish weavers who settled in the area during the 14th century helped to develop the woollen cottage industry. James Hargreaves, inventor of the spinning jenny, was a weaver in Oswaldtwistle near Blackburn, and the most rapid period of growth and development in Blackburn's history coincided with the industrialisation and expansion of textile manufacturing. Blackburn was a boomtown of the Industrial Revolution and amongst the first industrialised towns in the world. Blackburn's textile sector fell into terminal decline from the mid-20th century and subsequently faced similar challenges to other post-industrial northern towns, including deindustrialisation, economic deprivation and housing issues. In recent decades, the town has experienced very high levels of immigration, with people of ethnic backgrounds other than white British making up 30.8% of the population, above the regional and national average. Blackburn has had significant investment and redevelopment since 1958 through government funding and the European Regional Development Fund. Blackburn was recorded in the Domesday Book as Blacheborne in 1086. The origins of the name are uncertain. It has been suggested that it may be a combination of an Old English word for bleach, together with a form of the word "burn", meaning stream, and may be associated with a bleaching process. Alternatively, the name of the town may simply mean "black burn", or "black stream". There is little evidence of prehistoric settlement in the Blakewater valley, in which Blackburn developed. Evidence of activity in the form of two urn burials has been discovered from the Bronze Age in the hills around Blackburn. In 1879, a cinerary urn was discovered at a tumulus at Revidge, north of the town; another was excavated in 1996 at Pleasington Cemetery, west of the town, by gravedigger Grant Higson. The presence of a sacred spring—perhaps in use during the Iron Age—provides evidence of prehistoric activity in the town centre, at All Hallows Spring on Railway Road. All Hallows Spring was excavated in early archaeology in 1654 and found to contain an inscribed stone commemorating the dedication of a temple to Serapis by Claudius Hieronymus, legate of Legio VI Victrix. Christianity is believed to have come to Blackburn by the end of the 6th century, perhaps in 596 as there is a record of a "church of Blagbourne" in that year, or 598 AD. The town was important during the Anglo-Saxon era when the Blackburnshire Hundred came into existence as a territorial division of the kingdom of Northumbria. The name of the town appears in the Domesday Book as Blachebourne, a royal manor during the days of Edward the Confessor and William the Conqueror. Archaeological evidence from the demolition of the medieval parish church on the site of the cathedral in 1820 suggests that a church was built during the late 11th or early 12th century. A market cross was also erected nearby in 1101. The manor came into the possession of Henry de Blackburn, who divided it between his two sons. Later, one half was granted to the monks of Stanlow Abbey and this moiety was subsequently granted to the monks of Whalley Abbey. During the 12th century, the town's importance declined as Clitheroe became the regional centre. In addition to a settlement in the town centre area, there were several other medieval domiciles nearby. Workers producing shuttles for the textile industry, c. 1920. Rowland Baguley and Company, based on Addison Street, produced a wide range of shuttles for the home textile industry and for export before it closed in the early 1930s. Textile manufacturing in Blackburn dates from the mid-13th century, when wool produced locally by farmers was woven in their homes. Flemish weavers who settled in the area in the 14th century developed the industry. By 1650 the town was known for the manufacture of blue and white "Blackburn checks", and "Blackburn greys" became famous not long afterwards. By the first half of the 18th century textile manufacture had become Blackburn's main industry. From the mid-18th to the early 20th century Blackburn evolved from a small market town into "the weaving capital of the world", and its population increased from less than 5,000 to over 130,000. Blackburn. parl. and mun. bor., parish and township, NE. Lancashire, 9 miles (14 km) [14 km] E. of Preston and 210 miles (340 km) [340 km] NW. of London by rail – par., 48,281 ac., pop. 161,617; township, 3681 ac., pop. 91,958; bor., 6974 ac., pop. 104,014; 4 Banks, 2 newspapers. Market-days, Wednesday and Saturday. It is one of the chief seats of cotton manufacture, besides producing calico, muslin, &c., there being over 140 mills at work. There are also factories for making cotton machinery and steam-engines. B. has been associated with many improvements in the mfr. of cotton, among which was the invention (1767) of the "spinning jenny" which was invented in nearby Oswaldtwistle by James Hargreaves, who died in 1770. There are several fine churches and public buildings. A Corporation Park (50 ac. in area) is on the outskirts of the town. Several lines of railway converge here, and pass through one principal station belonging to the Lancashire and Yorkshire Ry. Co. B. returns 2 members to Parliament. From around 1750, cotton textile manufacturing expanded rapidly. Supplied with cotton by merchants, and paid by the piece, cottagers spun cotton into thread and wove it into cloth. The merchants arranged for cloth to be bleached and dyed. After 1775, spinning mills were built in the town. Early mills were warehouse conversions; the first purpose-built spinning mill was constructed in 1797 and by 1824 there were 24. The number of spindles reached 2.5 million by 1870 and spinning mills were constructed up to that time – 24 since 1850. Spinning declined between 1870 and 1900 as the sector transferred to south Lancashire. In 18th century Blackburn, weaving was primarily undertaken by handloom weavers working from their own cottages. However, as powerlooms were introduced into the mills after 1825, the percentage of handloom weavers began to decline and this occurred more rapidly in areas closer to the town. Handloom weavers continued to make up a sizable portion of the workforce in outlying rural areas. The last handloom shop in Blackburn closed in 1894. Improvements to the power loom in the early 1840s, and the construction of a railway line in 1846, led to greater investment in power looms in Blackburn in the second half of that decade. The railway brought opportunities for expansion of the cotton trade, and in subsequent decades many new mills were constructed: between 1850 and 1870, 68 weaving-only and four combined weaving/spinning mills were built and nine weaving mills were built per decade between 1870 and 1890. Improvements in power loom efficiency meant that weaving, the primary source of wealth and income for handloom weavers, began to transfer from the cottage industry to factories. This led to high rates of unemployment: according to figures published in March 1826, some 60% of all handloom weavers in Blackburn and Rishton, Lower Darwen and Oswaldtwistle were unemployed. High unemployment led to the Lancashire weavers' riots. At 3:00 pm on 24 April 1826 a mob arrived in Blackburn after attacking powerlooms in Accrington. Proceeding to Bannister Eccles' Jubilee Factory on Jubilee Street, the mob destroyed 212 powerlooms in the space of 35 minutes. They then turned their attention to John Houghton and Sons' Park Place factory, located nearby, and destroyed another 25 looms, before seeking more machinery to attack. The crowd began to disperse at around 6:00 pm, troops having arrived at 3:30 pm to try to quell the rioting. In 1890, Blackburn's Chamber of Commerce recognised that the town was over-dependent on the cotton industry, warning of the dangers of "only having one string to their bow in Blackburn". The warning proved prophetic when, in 1904, a slump hit the cotton industry and other industries dependent on it, such as engineering, brewing and building. In 1908, another slump saw 43 mills stop production and a quarter of the town's looms lay idle. Albion Mill photographed in 2008. The mill ceased production in 1975 and was demolished in 2010. Suspension of trade with India during the First World War resulted in the expansion of colonial British India's cotton industry at the expense of Britain's, and the imposition of an 11% import tariff by the colonial British Government led to a dramatic slump in trade in 1921, a situation which worsened in 1922 after the Indian Government raised the tariff to 14%. This caused the number of stopped mills to increase to 47, with 43,000 looms lying idle. Two years into the slump, Foundry and Limbrick Mills became the first to close permanently. Not long afterwards, in 1926, the General Strike saw production suspended at half the town's mills and 12,000 unemployed. There was another slump in 1928, and another strike in 1929 after employers requested a 12% wage cut; 40,000 cotton workers struck for a week and eight mills closed, making 28 closures in six years. By the start of 1930, 50 mills had shut and 21,000 people were unemployed. A financial crisis in 1931 led to 24,000 unemployed, with 1,000 houses and 166 shops lying empty in the town. A total of 26 mills closed down between 1930 and 1934. The industry experienced a short post-war boom between 1948 and 50, during which sales increased, industry training methods improved and automatic looms were introduced which allowed a single weaver to control 20 to 25 looms. Loom sheds were rebuilt to house new, larger looms. Despite the post-war boom, the cotton industry continued to decline and only 25% of the town's population were employed in textiles by 1951; this : this figure had stood at 60% up to the beginning of the Great Depression in 1929. In 1952 the number of weavers fell from 10,890 to 9,020. By 1955 more cloth was imported from India than was exported and between 1955 and 1958 another 16 mills closed. In 1959, due partly to the re-organisation of the textile industry as a result of the Textiles Act, another 17 mills closed. By 1960 there were 30 mills operating in Blackburn. Closures continued in the 1960s with The Parkside, Fountains, Malvern and Pioneer Mills shutting in 1964. In 1967 the Eclipse Mill at Feniscowles closed, unable to compete with imported cloth sold at nine pence cheaper per yard than the mill could produce. By the end of that year there were 26 mills operating. The 1970s saw further closures, and the number of textile workers in Blackburn reduced to 6,000 by January 1975, the year in which the Albion and Alston mills stopped production with the loss of 400 jobs. In 1976 there were 2,100 looms in operation in the town, compared with 79,405 in 1907. In 1927, Matthew Brown & Co. relocated to the town's Lion Brewery, on Coniston Road, following their acquisition of local brewer Nuttall & Co. Matthew Brown was the subject of a hostile takeover by Scottish & Newcastle Breweries in 1987, and ceased brewing in 1991. Blackburn became the first town to undertake the mass fingerprinting of people following the murder of June Anne Devaney in May 1948. June Anne Devaney was a three-year-old patient at Queens Park Hospital when she was abducted from her cot and murdered in the hospital grounds on 15 May 1948. Fingerprints on a bottle underneath her cot led the police to fingerprint every male over the age of 16 who was present in Blackburn on 14 and 15 May 1948. After taking over 46,500 sets of fingerprints, a match was made with Peter Griffiths, a 22-year-old ex-serviceman. Griffiths admitted his guilt and his trial ascertained if he was sane or not. After deliberating for 23 minutes, the jury found him sane and he was hanged at Liverpool Prison on Friday 19 November 1948. After his conviction, the police destroyed all fingerprints they had taken. Blackburn is administered by Blackburn with Darwen unitary authority, which encompasses Blackburn and the small town of Darwen to the south. The town sends one Member of Parliament (MP) to the House of Commons. The council has been elected "by thirds" since 1996[n 4] In its 2007 Comprehensive Performance Assessment (CPA), the Audit Commission described the council as "improving well" and gave it the highest "four star" overall performance rating. Although children's services, adult social care and GCSE results were praised, the commission did highlight "significant health problems" and increased "levels of repeat victims of domestic violence" as causes for concern. Despite generally good performance, overall user satisfaction levels with the council are below average and not improving. The borough has Beacon Council status and shares its best practice in education policy with other councils as part of the scheme. The historic constituency of Blackburn was created for the 1832 general election and sent two MPs to Westminster until it was abolished in 1950 and replaced for one parliamentary term by two new single-member constituencies, Blackburn East and Blackburn West. At the 1955 general election, Blackburn East and Blackburn West were merged into the modern-day constituency which is relatively tightly-formed and returns a single MP. Arms of the former Blackburn Borough Council on display in the town hall. The coat of arms of the former Blackburn Borough Council has many distinctive emblems. The blazon of the arms is: Argent a Fesse wavy Sable between three Bees volant proper on a Chief Vert a Bugle stringed Argent between two Fusils Or. On the crest, a Wreath of the Colours a Shuttle Or thereon a Dove wings elevated Argent and holding in the beak the Thread of the Shuttle reflexed over the back and an Olive Branch proper. The Latin motto of the town is Arte et Labore, correctly translated as "by art and by labour" but often translated as "by skill and hardwork". The motto, granted on 14 February 1852 to the former Borough of Blackburn, is poignant as Blackburn, once a small town, had risen to importance through the energy and enterprise of her spinners and manufacturers, combined with the skill and labour of her operatives. The Borough of Blackburn was formed by the amalgamation of the County Borough of Blackburn, the Borough of Darwen, part of the Turton Urban District and the parishes of Yate and Pickup Bank, Eccleshill, Livesey, Pleasington and Tockholes from the Blackburn Rural District. Blackburn council and its successor have been predominantly controlled by the Labour Party since 1945 and continuously for 19 years until May 2007 when it fell into no overall control. UKPollingReport characterises the constituency of Blackburn as "a mix of deprived inner-city wards dominated by Muslim voters, white working class areas and Conservative voting suburbs". Until 2015, the MP was former Secretary of State for Justice and former Foreign Secretary, Jack Straw. Previous MPs for Blackburn include former Labour cabinet minister Barbara Castle, who represented the town in Westminster from 1945 to 1979. The current distribution of seats (May 2018) is 44 seats for the Labour Party, 17 for the Conservatives and 3 for the Liberal Democrats. In the 1970s Blackburn experienced its first significant wave of Asian immigration and became a focus for far-right politics. In 1976, two National Party councillors were briefly elected, including John Kingsley Read. The next resurgence of support for the far right came after 2000. Around 20% of Blackburn's population come from ethnic minorities and in recent years the town has witnessed a resurgence in the fortunes of far-right political parties in local elections. The incumbent Liberal Democrats were pushed into third place behind Labour. Although the plans had been blocked by the time of the poll, proposals to convert a nursing home in the ward into a centre for asylum seekers were seen as a key election issue. Developments in Burnley and Blackburn were regarded as something of a renaissance for the far right in British politics; no such councillors had been elected in the UK since victories in Tower Hamlets nearly ten years before. Commenting on the elections, Blackburn MP Jack Straw said: "It is very sad. We had the far right in Blackburn 26 years ago when they won two seats in Shadsworth. But there the whole community decided they wouldn't have it. You can never say they won't put candidates in Blackburn but we will work hard on community relations." In July 1992, white and Asian youths rioted for several nights in Blackburn, with incidents taking place including an arson attack on a café which had allegedly been a meeting place for local Asians involved in organised crime. Although some towns in the North of England suffered race riots in the summer of 2001, the streets of Blackburn were undisturbed and the disturbance of the Summer 2011 riots was minimal. The council until recently had two members for the England First party, Mark Cotterill for Meadowhead ward and Michael Johnson for Fernhurst. Mark Cotterill has since stood down and Michael Johnson joined the For Darwen party. Members of the BNP have previously won a council seat in the town in November 2002 following elections in May which saw three of their colleagues elected in nearby Burnley. The BNP's Robin Evans secured a 16-vote majority in Mill Hill ward with two recounts following a campaign using pub meetings and leafleting. Robin Evans resigned from the party in October 2003. Source: "Records and averages". Yahoo! Weather. 2007. Archived from the original on 8 June 2011. At 53°44′41″N 2°28′37″W﻿ / ﻿53.74472°N 2.47694°W﻿ / 53.74472; -2.47694 (53.7449°, −2.4769°), and 184 miles (296 km) north-northwest of London, Blackburn stands 122 metres (401 ft) above sea level, 8.9 miles (14.3 km) east of Preston and 21 miles (34 km) north-northeast of Manchester. The Ribble Valley and West Pennine Moors lie to the north and south respectively. Blackburn experiences a temperate maritime climate, like much of the British Isles, with relatively cool summers and mild winters. There is regular but generally light precipitation throughout the year. 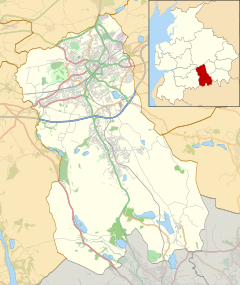 Although the city of Preston, the administrative centre for Lancashire, is located about 9.2 miles (15 km) to the west, Blackburn is the largest municipality in what is known as East Lancashire. The town is bounded on other sides by smaller towns, including Accrington to the east and Darwen to the south. Blackburn with Darwen forms a unitary authority. The village of Wilpshire, is 2 1⁄2 miles (4 km) north of Blackburn, and is partly contiguous (development-touching) however in the Ribble Valley local government district. Other nearby villages are Langho, approximately 1.2 miles (2 km) north-east, and Mellor to the north west. The small towns of Rishton, to the east, and Great Harwood, to the north east, are both in the local government district of Hyndburn. 11 miles (18 km) further to the east[clarification needed] lies the town of Burnley. View north over Lammack and Pleckgate from one of the highest points in Blackburn at the site of the old water tank at Revidge. To the west, the wooded Billinge Hill in Witton Country Park is 245 metres (804 ft) high, while Royal Blackburn Teaching Hospital is situated to the east of the town at a vantage point of 202 metres (663 ft). These figures can be considered in the context of other hills and mountains in Lancashire, including Great Hill at 456 metres (1,496 ft), Winter Hill at 456 metres (1,496 ft), Pendle Hill at 557 metres (1,827 ft) and Green Hill at 628 metres (2,060 ft). The River Blakewater, which gives its names to the town, flows down from the moors above Guide and then through the areas of Whitebirk, Little Harwood, Cob Wall and Brookhouse to the town centre. The river is culverted and runs underground in the town centre, under Ainsworth Street and between Blackburn Cathedral and the Boulevard. On the western side of the town centre the Blakewater continues through the Wensley Fold area before joining the River Darwen outside Witton Country Park; the Darwen flows into the River Ribble at Walton-le-Dale. The geology of the Blackburn area yields numerous resources which underpinned its development as a centre of manufacturing during the Industrial Revolution. Mineable coal seams have been used since the mid-late 16th century. The Coal Measures in the area overlie the Millstone Grit which has been quarried in the past for millstones and, along with local limestone deposits, used as a construction material for roads and buildings. In addition, there were deposits of iron ore in the Furness and Ulverston districts. The Blackburn area was subjected to glaciation during the Pleistocene ice age, and the sandstone-and-shale bedrock is overlain in much of the area by glacial deposits called till (which is also called "boulder clay") of varying thickness up to several tens of feet. Glacial outwash (sand and gravel) also occur in small patches, including along Grimshaw Brook. Blackburn is within a green belt region that extends into the wider surrounding counties, and is in place to reduce urban sprawl, prevent the towns in the nearby Greater Manchester and Merseyside conurbations from further convergence, protect the identity of outlying communities, encourage brownfield reuse, and preserve nearby countryside. This is achieved by restricting inappropriate development within the designated areas, and imposing stricter conditions on permitted building. Sizeable areas of green belt exist within the borough, west and south of Blackburn surrounding Witton Country Park and Pleasington parish, with other parishes in the borough containing portions of green belt, Tockholes, Eccleshill, Yate & Pickup Bank parish, Livesy, Darwen, with North Turton largely covered. The green belt was first drawn up in 1982 under Lancashire County Council, and the size in the borough in 2017 amounted to some 5,260 hectares (52.6 km2; 20.3 sq mi). At the time of the UK Government's 2001 census, Blackburn, defined as an urban area, had a population of 105,085 and a population density of 11,114/sq mi (4,291/km2). According to further statistics from the same census, this time defining Blackburn as a Westminster parliamentary constituency, the population was 69.22% White British (national average for England 89.99%) with significant Indian (14.31%) and Pakistani (11.45%) ethnic minorities. 12.33% of the population was born outside the European Union. In terms of religion, 57.53% of residents were Christian (average for England 71.74%), 25.74% Muslim (average for England 3.1%) and 15.98% no religion or not stated. With regard to the economic activity of those aged 16–74, the 2001 Census indicates that 33.93% were full-time employees (average for England 40.81%), 11.72% were part-time employees, 5.97% were self-employed (average for England 8.32%), and 4.5% were unemployed (average for England 3.35%). The 2001 census also records the social grade of the constituency's 72,418 people aged 16 and over: using the NRS social grades system, 10,748 were classed as AB (higher and intermediate managerial / administrative / professional), 17,514 as C1 (supervisory, clerical, junior managerial / administrative / professional), 11,691 as C2 (skilled manual workers), 19,212 as D (semi-skilled and unskilled manual workers), and 13,253 as E (on state benefit, unemployed, lowest grade workers). Additionally, Blackburn with Darwen Borough Council manages a site for gypsies and travellers in the Ewood area of the town. The 2011 census showed that there was an increase in the number of people of ethnic minorities living within the Blackburn with Darwen area. Results showed that 31% of people living in the area were of an ethnic minority background, with 66.5% of the population defined as white British. This equates to roughly 45,500 people within Blackburn with Darwen being of a black minority ethnic group. This level is three times greater than the average across Lancashire and the rest of the region. Whalley Range in the north was a popular destination for Asian immigrants, who make up the majority of the district's population. In common with other towns in the UK, Blackburn has seen an increase in the number of immigrants from Eastern Europe. There is a distinct contrast between different areas with ethnic groups due to segregation. Areas south and west of the town centre such as Ewood have an indigenous majority, with all wards in the area being more than 85% White British. In contrast, most wards north and east of the town centre have an Asian majority but also a small but increasing community of people from mainland Europe. The town centre is currently subject to a new multimillion-pound investment, and Blackburn with Darwen Council have already made some refurbishments and renovations of key public places, notably the Church Street area with its Grade II listed art deco Waterloo Pavilions complemented by street furniture and sculptures. The Mall Blackburn (formerly known as Blackburn Shopping Centre) is the main shopping centre in Blackburn with over 130 shops and 400 further outlets close by. Blackburn Market opened in a new site under the shopping centre in June 2011 and now opens six days a week (Monday to Saturday) . The previous market was based on the other side of Ainsworth Street. It first opened on this site in 1964, where there was a 3-day market (Wednesday, Friday, Saturday) and the Market Hall (Monday-Saturday). The town centre was expanded by construction of the Grimshaw Park retail development (including Blackburn Arena) in the 1990s. The adjacent Townsmoor Retail Park and Peel Leisure and Retail Park are more recent developments. One of the town's most well-known shops, the shoe store Tommy Ball's, closed in May 2008 after going into administration. The town's oldest store, Mercer & Sons, also closed after a decline in sales blamed on the credit crunch. It opened in 1840 and was originally an ironmonger but the public store converted to selling toys, household goods and hardware. However, in January 2009 the directors of the company announced that the shop would close following a 30-day statutory consultation, unless they change their mind or a buyer is found. The markets continue to offer a wide range of local produce—Lancashire cheeses, tripe, Bowland beef and lamb can all be found. Walsh's Sarsaparilla stall decided not to move into the new market development. The market moved into the Mall shopping centre in 2011, and now opens 6 days a week (closed on bank holidays). Major employers in Blackburn include: Blackburn College, Thwaites Brewery, BAE Systems (Samlesbury Aerodrome site, located at Samlesbury, northwest of Blackburn); Blackburn with Darwen Borough Council; and the East Lancashire Hospitals NHS Trust (based at the Royal Blackburn Hospital). A trade park, Drumstone Trade Park near the town centre, has trade outlets. Numerous business parks exist in and around the town. The Leeds and Liverpool Canal runs through Blackburn from Feniscowles in the SW to Whitebirk in the NE, skirting the town centre to the east of Blackburn railway station. This important early industrial artery arrived in the town in 1810 and became the chief focus for industrial growth in the 19th century, with raw cotton imported via Liverpool. While it suffered neglect in the wake of the area's industrial decline, the Blackburn stretch has benefited from a number of regeneration projects since the 1990s. British Waterways residential moorings are to be found at Finnington Lane Bridge on the western edge of the borough. The M65 motorway passes to the south of Blackburn. It runs from Colne, about 17 miles (27.4 km) north-east of Blackburn, to a point close to the village of Lostock Hall near Preston, about 12 miles (19.3 km) to the west. Junction six of the motorway is located at the eastern edge of Blackburn, near the Intack area; junctions five and four are located to the south, near the village of Guide and the Lower Darwen area respectively; and junction three is located at the south-western edge of the town, close to the Feniscowles area. The M65 links Blackburn to the national motorway network, connecting to junction nine of the M61 and junction 29 of the M6. Other major roads in and around Blackburn include the A666 and the A677. The A666 runs from the A59 near the village of Langho, approximately 3.7 miles (6.0 km) to the north-west of Blackburn. It passes through the town centre and continues south through the towns of Darwen and Bolton then south-west to the town of Pendlebury, near Manchester, where the road joins the A6 at Irlams o' th' Height. The A677 runs from the east part of Blackburn, about 1.5 miles (2.4 km) from the centre. It passes through the centre of the town and continues to the western outskirts. It then heads north-west to the village of Mellor Brook before continuing west again towards the city of Preston. It joins the A59 about 5.5 miles (8.9 km) west of Blackburn, approximately halfway between Blackburn and Preston. Barbara Castle Way (named after the former Blackburn MP) runs from Montague Street to Eanam Roundabout, passing close to the town centre, the road is part of the A6078 town centre orbital route. Blackburn's newly redeveloped railway station is in the town centre, and is served by Northern. Services to Manchester Victoria station typically take around 50 minutes. The station also hosts East Lancashire Line services travelling eastwards to Burnley, Colne and Leeds, as well as westwards to Preston. Blackburn's new bus station on Ainsworth Street opened in May 2016. A new interchange was built outside the station as part of the Cathedral Quarter redevelopment where all buses continue to Blackburn Bus Station. Manchester Airport, the busiest airport in the UK outside London, is the nearest airport from Blackburn with scheduled flights, about 28 miles (45 km) to the southeast of the town. Blackburn Cathedral was formerly St Mary's Parish Church. St Mary's was reconsecrated in 1826 on the site of the previous church that had stood for several hundred years. In 1926 the Diocese of Blackburn was created and the church gained cathedral status. Blackburn was selected above other locations for the 'new wave' of Archbishop Temple's cathedrals because of its then excellent public transport infrastructure – the cathedral stands next to the bus and railway station[n 6]. Between the 1930s and 1960s an enlarged cathedral was built using the existing building as the nave. Six of the cathedral's bells were cast in 1737 and are claimed to have been cast from even older bells. An image of the cathedral is used behind BBC interviews held in Blackburn, which are filmed at BBC Radio Lancashire on Darwen Street, opposite the cathedral. Main articles: Ewood Park and Blackburn Rovers F.C. The ground was officially opened in AprIl 1882. Work on the current, redeveloped, all-seater stadium got underway in February 1993 when the old Darwen End stand was demolished. This stand, together with the old Blackburn End stand, was then redeveloped before the Nuttall Street stand was also demolished ready for redevelopment in January 1994. Almost two years later, on 18 November 1995, the newly redeveloped Ewood Park was officially opened. With a capacity of 31,367, the facility comprises four sections: the Darwen End, Riverside Stand (named as such because it stands practically on the banks of the River Darwen), Blackburn End, and Jack Walker Stand, which is named after Blackburn industrialist and club supporter, Jack Walker. The stadium also houses conference and banqueting facilities. Blackburn's statue of Queen Victoria is located next to the cathedral grounds overlooking the Cathedral Square. Victoria's fourth daughter, Princess Louise, Duchess of Argyll, unveiled the statue on 30 September 1905. It was sculpted by Australian sculptor Sir Bertram McKennal out of white Sicilian marble and stands on a grey granite plinth. The statue is 11 feet (3.4 m) high and weighs 9 long tons (9.1 t), while the plinth is 14 feet (4.3 m) high and weighs 30 long tons (30.5 t). 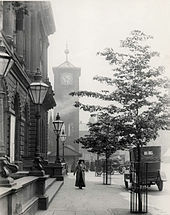 The construction of Blackburn's original, Italian renaissance style town hall was completed in 1856 at a cost of £35,000, equivalent to about £1.5 million as at 2008. The architect was James Paterson and the contractors were Richard Hacking and William Stones. It originally housed a police station with 18 cells, a large assembly room, and a council chamber. A tower block extension was constructed in 1969 at a cost of £650,000, equal to about £6.6 million as at 2008. The tower block is not strictly an extension to the earlier building: the two buildings are connected only by an elevated, enclosed footbridge. The tower block was 198 feet (60 m) high and the top was 545 feet (166 m) 9 inches (23 cm) above sea-level when built, although it has since been re-clad and these figures may have altered slightly. The two buildings are known locally as the new town hall and old town hall respectively. The foundation stone of the Technical School building was laid on 9 May 1888 by the Prince and Princess of Wales; the building was completed towards the end of 1894. It is built in the Northern Renaissance style and has a slate roof, an attic, a basement, and two intermediate storeys. Made mainly of red brick and yellow terracotta, it is profusely decorated and features ornate gables, a round arched entrance with angle turrets and balcony above, and a frieze below the top storey with panels depicting art and craft skills. The Technical School is a grade II listed building and is now part of Blackburn College. Prince Charles- The Prince of Wales placed a time capsule into the wall of the college during his visit to Blackburn. The college celebrated its 125th anniversary in 2013. The Wainwright Bridge was opened in June 2008. The £12 million bowstring arch bridge crosses the East Lancashire and Ribble Valley railway lines west of the town centre and forms part of the A6078 Town Centre Orbital Route. The bridge is named after Alfred Wainwright following a vote by the townspeople. Blackburn Arena, which houses an ice rink and is home to the Blackburn Hawks ice hockey team, opened in 1991. Blackburn railway station features a 24-foot (7.3 m) mural by Ormskirk-based contemporary artist Stephen Charnock. It depicts eight famous faces associated with the town, including Mohandas Gandhi, who visited nearby Darwen in 1931. The station was renovated in 2000. BBC Radio Lancashire has its studios on Darwen Street in the town centre. Thwaites Brewery, which produces cask ale, has had a position in the centre of the town since 1870. There is also King George's Hall, which is an arts and entertainment centre and Thwaites Empire Theatre. A section of the Leeds and Liverpool Canal runs through the town. St Anne's Roman Catholic Church is also situated in the centre of the town, is a Lombard Romanesque church, built in 1926, destroyed by arson in 2002 and rebuilt in 2004. The Canterbury Street drill hall was completed in 1870. Corporation Park, to the northwest of the town centre, was built on 20 hectares (50 acres) of land purchased from Joseph Feilden, lord of the manor, for £50 per 1 acre (0.40 ha) in 1855. The park officially opened on 22 October 1857, with shops and mills closing for the day, church bells ringing, and flags flying from public buildings. Railway companies claimed 14,000 people travelled to the town for the opening. A conservatory was opened in the park on 16 May 1900. Within Corporation Park is the Blackburn War Memorial which commemorates people who lost their lives in World War I and World War II. The towns annual Armistice parade concludes at the war memorial. The town's Queen's Park was opened in June 1887, having been laid out at a cost of £10,000 on land acquired by Blackburn Corporation from the Ecclesiastical Commissioners in 1882. It originally had two bowling greens, two tennis courts, a lake of over 1.2 hectares (3 acres), a children's paddling pool, a bandstand, and a refreshment room. Two additional bowling greens and a pavilion were added in 1932. The main lake in Queen's Park. Witton Country Park is a 190-hectare (480-acre) space to the west of the town. The land was purchased in 1946 and was the ancestral home of the Feilden family. It is larger than all the town's other parks and playing fields put together. Witton Park High School is located within the park, as are three astroturf football pitches and a full-size athletic track, which is home to the Blackburn Harriers. The Blackburn model aircraft club also use the park for flying radio controlled aircraft. Pleasington cemetery and crematorium are located on the park's outer edges. Roe Lee Park, in the north of the town, was opened on Wednesday 30 May 1923 and was intended to commemorate the visit of George V. It was originally a 6.5-hectare (16-acre) site with five tennis courts and three bowling greens. The borough council's website describes the park as a 7-hectare (17-acre) "urban fringe park with bowling greens, kick around area and children's playground". In 2007, all four parks described above were winners of Green Flag awards. Blackburn Central Library is located in the town centre, close to the town hall, and is described as "the seventh most visited library in England". The library has various sections and facilities, including: an information and reference section, a media section, a community history section, a children's library, and a creche. An ICT training suite at the library has been named the "Bill Gates Room". Blackburn has smaller libraries serving the Mill Hill, Livesey and Roman Road parts of the town, as well as a mobile library service. Secondary education in Blackburn is provided by nine state-funded schools. In 2005, Tauheedul Islam Girls' High School became the first Muslim state school in the North West. It had previously been an independent school. The school has been a success in school league tables, with 82% of pupils gaining five or more GCSEs at grade C or above in 2007, compared to the national average of 46.7%. Since then Tauheedul Islam Boys' High School has been established and Queen Elizabeth's Grammar School joined the state-funded sector. The town also has a few special schools. St Thomas's and Sunnyhurst Pupil Referral Unit educates children who are unable to attend mainstream school for health reasons or other difficulties. Over £25 million was invested in educational initiatives in Blackburn with Darwen in the late 2000s, including new schools, city learning centres and children's centres. Over 11,000 adults are taking part in some form of educational programme. Blackburn with Darwen council has twice had Beacon Status for education in the "Fostering School Improvement" and "Transforming the School Workforce" categories. Compared with 56.5% nationally, 51.3% of pupils in Blackburn with Darwen achieve grades A*–C. The average GCE/VCE A/AS and Equivalent Point Score per Student is 649.7 compared with 716.7 nationally. Although the town's ethnic minority population is below 25%, in some schools the vast majority of pupils are from the ethnic minority population, whilst other schools are almost entirely white. This segregation has been identified as a problem for racial integration within the town. The independent school sector is represented in the town by Westholme School and Jamiatul Ilm Wal Huda, as well as a few other private Islamic schools. The two further education colleges in the town are Blackburn College and the sixth-form St. Mary's College. The town does not have a university, but some higher education courses are provided by the East Lancashire Institute of Higher Education (ELIHE), which provides degree-levels courses for students over the age of 18. Main article: Blackburn Rovers F.C. EFL Championship side Blackburn Rovers is based at the Ewood Park stadium. The club was established in 1875, becoming a founder member of The Football League in 1888. In 1890 Rovers moved to its permanent home ground at Ewood Park. Until the formation of the Premier League in 1992, the majority of Blackburn Rovers' success was pre-1930 when they won the league twice and FA Cup six times. After finishing runners-up to regional archrivals Manchester United in 1993–1994, Rovers won the English Premier League the following year. In 2002 they won the League Cup. Blackburn has an Olympic-sized ice rink housed at the 3,200-seat Blackburn Arena. The arena is the home of the Blackburn Hawks and Lancashire Raptors ice hockey teams, both of which play in the English National Ice Hockey League. Although Lancashire County Cricket Club play inter-county cricket at Old Trafford Cricket Ground, the town club at Alexandra Meadows on Dukes Brow is East Lancashire Cricket Club. Blackburn Northern Cricket Club state they have recently leased the Ribchester Cricket Ground for their matches. The title of the unofficial fanzine of the town's football club, Blackburn Rovers, is 4,000 Holes, and the 1968 Beatles film Yellow Submarine has John mentioning the lyric as well in the "Sea of Holes". In 1975 documentary film maker Nick Broomfield made Juvenile Liaison about a juvenile liaison project in the town. The film examines a series of children and their run-ins with the law, over minor wrongdoings such as theft, truancy and being abusive to parents. After its production, the film was banned by the BFI for many years; Juvenile Liaison revolved mainly around the activities of Sergeant Ray, whose preventative measures when dealing with young trouble makers fell mainly in the strong-arm category of approach. In 1990 Nick Broomfield returned to Blackburn to film a follow up. Juvenile Liaison 2 revisits some of the residents from the first film, in some sort of attempt to measure the success of the scheme. The 1994 TV film Pat and Margaret starring Victoria Wood and Julie Walters was partly filmed in Blackburn. The TV show Hetty Wainthropp Investigates, screened on BBC One from 1996 to 1998, included many scenes shot in Blackburn. The 2005 British film Love + Hate, directed by Dominic Savage, was shot in Blackburn. The Victorian filmmakers Mitchell and Kenyon were based in Blackburn in the early 20th century. A large amount of their film stock, some 800 negatives, was found in their old premises on Northgate in 1994 and is now in the safekeeping of the British Film Institute. During late 2015, work being done on St Peter's Burial Ground in advance of road construction involved the disinterment of the remains of nearly 2,000 individuals who had been buried there during the cemetery's period of operation (1821–1945). The burial ground had been connected with the former St Peter's Church, a large one which seated some 1,500 people, which was demolished in 1976. Archaeologists found that nearly half of the bodies were those of young children, who appeared to have died quickly during the mid-19th century from illnesses affected the lungs and gastrointestinal system. The numbers are taken as reflecting the massive increase in the city's population during that period due to its booming textile industry, which led to unhealthy living situations among the working classes. The remains were to be relocated to another section of the cemetery. A memorial service conducted by Julian Henderson, the Bishop of Blackburn, for those being re-buried was scheduled to be held during the summer of 2016. Jack Walker, steel baron and one time owner of local steel company Walkersteel, was born in the town in 1929 and lived locally until he moved to the Channel Islands in 1974. He was the former owner of Blackburn Rovers. In the political arena, William Henry Hornby, a leading industrialist, the first mayor of Blackburn, and Chairman of the Conservative Party was born in the town in 1805. 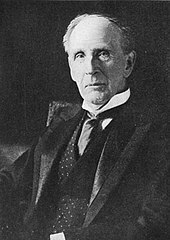 John Morley, 1st Viscount Morley of Blackburn, OM, PC, Liberal statesman, writer and newspaper editor was born in the town in 1838. The town is also closely linked to Barbara Castle who was an MP in Blackburn for 34 years (1945–1979) as well as holding the positions of Secretary of State for Employment and Productivity, First Secretary of State and Secretary of State for Social Services during the Labour governments of the sixties and seventies. William Billington (1825–1884), writer, known as the "Blackburn Poet"
Frank Fielding, footballer for Bristol City F.C. Anthony Pilkington, footballer for Cardiff City F.C. ^ Not to be confused with Salford in Greater Manchester. The ancient military way from Mamucium (Manchester) to (Bremetennacum) (Ribchester), passing over Blacksnape, plunges on its unswerving course through Blackamoor, over the scarp at Whinney Heights, to pass across the Blakewater in the vicinity of Salford. This fact alone presents a reasonable argument for the existence of a British oppidum or walled village on the site, it being customary for such primitive communities to cluster in the vicinity of a ford or bridge. ^ Both interchanges have been reduced in scale since. ^ a b c "KS01 Usual resident population: Census 2001, Key Statistics for urban areas". National Statistics. Office for National Statistics. Archived from the original on 7 September 2009. Retrieved 9 July 2008. ^ "Authorities: AGMA Policy and Research Unit". Association of Greater Manchester Authorities. Archived from the original on 18 October 2015. Retrieved 11 May 2010. ^ Census 2001: Blackburn with Darwen Local Authority, Office for National Statistics. Retrieved 28 March 2008. ^ a b Burrow, J & Co. (Eds.) (1960), p. 8. ^ "Blackburn.gov.uk - Ethnicity and Religion profile" (PDF). ^ Miller (1992), p. 6. ^ a b Beattie (1992), p. 11. ^ "Rare Treasure Found". Lancashire Evening Telegraph. Newsquest Media Group. 27 March 1996. Retrieved 6 June 2017. ^ "Lancashire Historic Town Survey: Blackburn: Historic Town Assessment Report" (PDF). Lancashire County Council. April 2005. p. 16. Archived from the original (PDF) on 28 February 2008. Retrieved 3 March 2008. ^ a b Lancashire County Council (2005), Lancashire Historic Town Survey: Blackburn, p. 16. ^ Miller (1992), p. 4. ^ Site of All Hallows Spring-Holy well, Archaeology Data Service. Retrieved 31 January 2007. ^ Church of St. Mary the Virgin Archived 24 October 2007 at the Wayback Machine, Archaeology Data Service. Retrieved 31 January 2007. ^ Burrow, J & Co. (Eds.) (1960). p. 7. ^ a b c d Lancashire County Council (2005), Lancashire Historic Town Survey: Blackburn, p. 17. ^ Market Cross Archived 24 October 2007 at the Wayback Machine, Archaeological Data Society. Retrieved 31 January 2007. ^ Beattie (1992), p. 49. ^ Vision of Britain: Bartholomew Gazetteer Entry for Blackburn, A Vision of Britain through Time, Retrieved 21 April 2008. ^ Beattie (1992), pp. 15–16. ^ Beattie (1992), pp. 16–18. ^ Beattie (1992), p. 17. ^ Turner (1992), p. 9. ^ Turner (1992), p. 12. ^ Turner (1992), pp. 18–24. ^ Taylor (2000), p. 11. ^ Taylor (2000), p. 18. ^ Taylor (2000), p. 24. ^ a b Taylor (2000), pp. 109–110. ^ a b c d e f Taylor (2000), pp. 47–55. ^ "Indian Duties". Cotton Town. Blackburn with Darwen Borough Council. Archived from the original on 26 October 2007. Retrieved 19 May 2008. ^ "Financial Crisis". Cotton Town. Blackburn with Darwen Borough Council. Archived from the original on 26 October 2007. Retrieved 19 May 2008. ^ "Post-War Boom". Cotton Town. Blackburn with Darwen Borough Council. Archived from the original on 25 October 2007. Retrieved 19 May 2008. ^ Taylor (2000), p. 83. ^ a b "1950s Decline". Cotton Town. Blackburn with Darwen Borough Council. Archived from the original on 24 October 2007. Retrieved 19 May 2008. ^ Taylor (2000), p. 87. ^ Taylor (2000), p. 91. ^ Taylor (2000), p. 94. ^ "Local Decline". Cotton Town. Blackburn with Darwen Borough Council. Archived from the original on 26 October 2007. Retrieved 19 May 2008. ^ "The End of an Industry". Cotton Town. Blackburn with Darwen Borough Council. Archived from the original on 26 October 2007. Retrieved 19 May 2008. ^ "20th Century Changes: Production and Decline". Cotton Town. Blackburn with Darwen Borough Council. Archived from the original on 16 June 2008. Retrieved 19 May 2008. ^ "Daniel Thwaites Location". Thwaites.com. Thwaites. Retrieved 17 February 2018. ^ "The Fingerprint Society Commemorates 60 Years Since Landmark Fingerprint Identification". The Fingerprint Society. 2011. Archived from the original on 6 March 2012. Retrieved 12 September 2012. ^ "Sixty Years of Fingerprints" (Video). BBC. 20 August 2008. Retrieved 12 September 2012. ^ Woodruff, Lorna. "The Murder of June Anne Devaney". Cottontown.org. Archived from the original on 4 April 2012. Retrieved 12 September 2012. ^ a b c Blackburn with Darwen Borough Council Comprehensive Performance Assessment (CPA) scorecard 2007 Archived 7 July 2011 at the Wayback Machine, Audit Commission, Retrieved 5 July 2008. ^ "Home - Blackburn with Darwen Council". www.blackburn.gov.uk. ^ "Blackburn Is open". Retrieved 17 February 2018. ^ UK Parliament. The English Non-metropolitan Districts (Definition) Order 1972 as made, from legislation.gov.uk. ^ Shocked Labour loses control of Blackburn with Darwen, David Bartlett, Lancashire Telegraph, 4 May 2007, Retrieved 6 June 2017. ^ "UK Politics: Local Elections 2000: Blackburn with Darwen". BBC News. Retrieved 4 July 2008. ^ Blackburn Election Guide, UKPollingReport, Retrieved 12 April 2008. ^ Wilson, Graeme & Powell, Adam (23 November 2002). "Straw condemns BNP after victory in his backyard". Daily Mail. Associated Newspapers Ltd.
^ Braid, Mary & Walker, Nick (17 September 1993). "BNP wins seat on East End council after recount". The Independent. Independent News and Media. ^ Higginson, David (27 November 2002). "BNP secures three seats". Newsquest Media Group. ^ Ward, David (23 November 2002). "BNP snatches council seat in Straw constituency". The Guardian. London. Retrieved 5 July 2008. ^ Map of Blackburn and surrounding region, Google Maps; RecPath Archived 20 August 2006 at the Wayback Machine used for distances. ^ "Coal mining in Blackburn with Darwen". Cotton Town. Blackburn with Darwen Borough Council. Archived from the original on 17 June 2006. Retrieved 27 October 2006. ^ "Geography and geology". Cotton Town. Blackburn with Darwen Borough Council. Archived from the original on 8 December 2006. Retrieved 27 October 2006. ^ Contaminated land inspection strategy Archived 2 November 2006 at the Wayback Machine. Blackburn with Darwen Borough Council. Retrieved 6 July 2008. ^ a b "Blackburn with Darwen Local Development Framework Green Belt Study" (PDF). ^ 2001 Census: Key Statistics, Ethnic Group (KS06), Office for National Statistics. Retrieved 18 March 2008. ^ 2001 Census: Key Statistics, Country of Birth (KS05), Office for National Statistics. Retrieved 18 March 2008. ^ 2001 Census: Key Statistics, Religion (KS07), Office for National Statistics. Retrieved 18 March 2008. ^ 2001 Census: Key Statistics, Economic Activity (KS09A), Office for National Statistics. Retrieved 18 March 2008. ^ 2001 Census: Key Statistics, Approximated Social Grade (UV50), Office for National Statistics. Retrieved 18 March 2008. ^ "Gypsy and traveller sites – Ewood travellers site". A-Z of Services. Blackburn with Darwen Borough Council. Archived from the original on 26 September 2011. Retrieved 3 October 2012. ^ "Is Blackburn really a town of racial divide?". Daily Mail. London. 6 May 2007. ^ "Waterloo Pavilions". Blackburn with Darwen Borough Council. Archived from the original on 11 October 2007. Retrieved 5 July 2008. ^ Blackburn is placed in a similar position to its neighbour Burnley in most consumer spending and footfall rankings. Along with Burnley, Bolton, Preston and Bury are the towns' main retail destination rivals.Tourism in Blackburn with Darwen: Shopping Archived 27 April 2006 at the Wayback Machine, Blackburn with Darwen Borough Council, 8 November 2005, Retrieved 2 May 2006. ^ "Blackburn's New Market open for business". Blackburn Life. Retrieved 27 November 2011. ^ Moseley, Tom (27 May 2008). "Famous Blackburn shoe store Tommy Ball's closes". Lancashire Telegraph. Newsquest Media Group. Retrieved 11 January 2009. ^ Moseley, Tom (9 January 2009). "Shock as Blackburn's oldest shop announces plans to close". Blackburn Citizen. Newsquest Media Group. Retrieved 11 January 2009. ^ Moseley, Tom (24 February 2008). "Market site 'not for supermarket'". Lancashire Telegraph. Newsquest Media Group. Retrieved 8 July 2008. ^ Wilson, James (26 April 2007). "A busy hub of connectivity". Financial Times – FT report – doing business in Manchester and the NorthWest. The Financial Times Limited. ^ Duckworth and Halsall (2002), p. 25. ^ "Blackburn Cathedral". Cotton Town. Blackburn with Darwen Borough Council. Archived from the original on 24 October 2007. Retrieved 20 May 2008. ^ Taylor (2000), p. 9. ^ Jackman (2006), pp. 29–30. ^ Jackman (2006), pp. 181–187. ^ "Stadiums in England: North West". World Stadiums. Archived from the original on 31 May 2008. Retrieved 29 May 2008. ^ Taylor (2000), p. 20. ^ Duckworth and Halsall (2002), p. 24. ^ Beattie (2007), p. 139. ^ a b "Currency converter". The National Archives. Retrieved 8 July 2008. ^ Duckworth (2005), p. 20. ^ Burrow, J & Co. (Eds.) (1970), p. 16. ^ Blackburnlad. "The Old Town Hall – King William Street". Blackburn Past: A look at Blackburn Lancashire in Days gone by. Retrieved 2 October 2012. ...or as we refer to it today, the Old Town Hall (the 1960s tower block being the 'new' Town Hall). ^ Beattie (2007), pp. 197–198. ^ "Blackburn Technical School". Cotton Town. Blackburn with Darwen Borough Council. Archived from the original on 30 October 2007. Retrieved 24 April 2008. ^ Timmins (1993), plate 161. ^ Moseley, Tom (27 June 2008). "Blackburn's Wainwright bridge opens to traffic". Lancashire Telegraph. Newsquest Media Group. Retrieved 29 June 2008. ^ "Steel brought in for £9m bridge". BBC News. 26 July 2007. Retrieved 19 May 2008. ^ "Wainwright remembered with new bridge". Lancashire Telegraph. Newsquest Media Group. 31 March 2008. Archived from the original on 20 September 2010. Retrieved 19 May 2008. ^ "Blackburn Drill Hall". English Heritage. Retrieved 26 August 2017. ^ a b Duckworth (2005), p. 75. ^ Duckworth (2005), p. 65. ^ Corporation Park. Archived 13 June 2013 at the Wayback Machine East Lancashire Memorials. Retrieved 17 August 2012. ^ Corporation Park, garden of Remembrance. Archived 7 June 2011 at the Wayback Machine Blackburn with Darwen Borough Council. Retrieved 17 August 2012. ^ The Blackburn war memorial. Retrieved 17 August 2012. ^ Duckworth (2005), pp. 78–79. ^ a b Duckworth (2005), p. 79. ^ Roe Lee Park Archived 7 June 2011 at the Wayback Machine. Blackburn with Darwen Borough Council. Retrieved 5 June 2008. ^ "Parks awarded prestigious Green Flags". Lancashire Telegraph. Newsquest Media Group. 17 July 2007. Retrieved 6 July 2007. ^ Libraries Archived 10 October 2007 at the Wayback Machine, Blackburn with Darwen Borough Council, Retrieved 4 July 2008. ^ Blackburn Central Library Archived 24 October 2007 at the Wayback Machine, Blackburn with Darwen Borough Council, Retrieved 4 July 2008. ^ Our Libraries Archived 10 October 2007 at the Wayback Machine, Blackburn with Darwen Borough Council, Retrieved 4 July 2008. ^ "Search results: Establishments in 'Blackburn with Darwen'". Get information about schools. UK Government. Retrieved 28 January 2018. ^ "School celebrates new funded status". Lancashire Evening Telegraph. Newsquest Media Group. 17 June 2005. Retrieved 3 March 2008. ^ "Tauheedul Islam Girls' High School". BBC News. 10 January 2008. Retrieved 11 December 2008. ^ Easton, Mark (14 June 2006). "School choice 'means classroom ghettos'". BBC News. Retrieved 3 March 2008. ^ Blackburn Rovers club profile Archived 11 May 2008 at the Wayback Machine. www.premierleague.com. Retrieved 29 May 2008. ^ "East Lancashire Club - Member of Lancashire Cricket League". www.eastlancssportsclub.co.uk. ^ "Blackburn Northern CC - Play-Cricket -". 31 January 2013. Archived from the original on 31 January 2013. ^ Musical mystery solved on tour. www.cnn.com. Retrieved 30 May 2008. ^ "Love + Hate", Internet Movie Database. Retrieved 10 May 2008. ^ "Love + Hate – film review", BBC website. Retrieved 10 May 2008. ^ "Blackburn archaeological survey: Bodies of 800 young children found". BBC News. 26 January 2016. ^ "Football remembers Jack Walker". BBC News. 18 August 2000. ^ "Ian McShane". BBC. Retrieved 4 July 2008. ^ "Steve Pemberton", Internet Movie Database. Retrieved 6 September 2006. ^ "Essential facts on Queen Elizabeth's Grammar School, Blackburn". This Is Lancashire. Newsquest Media Group. 27 August 2001. Archived from the original on 19 March 2007. Retrieved 14 May 2006. ^ Wells, Colin (13 March 2004). "John Sumner obituary". The Independent. London. Retrieved 6 June 2017. ^ "Partnerstädte / Patenschaften". Retrieved 1 May 2014. ^ "Miasta Partnerskie". Retrieved 1 May 2014. Abram, W. A. (1990) . A History of Blackburn Town & Parish (Limited second edition reprint ed.). T.H.C.L. Books. ISBN 0-948494-10-7. Beattie, Derek (1992). Blackburn: The Development of a Lancashire Cotton Town. Keele University Press. ISBN 1-85331-021-2. Beattie, Derek (2007). Blackburn: A History by Derek Beattie. Carnegie Publishing. ISBN 1-85936-113-7. Burrow, J and Co., ed. (1960). Blackburn: Official Handbook. Cheltenham and London. Burrow, J and Co., ed. (1970). Blackburn: Official Handbook. Cheltenham and London. ISBN 0-85026-110-4. Duckworth, Alan (2005). Blackburn: Town and City memories. The Francis Frith Collection. ISBN 1-85937-986-9. Duckworth, Alan & Halsall, Jim (2002). Blackburn in Focus. Landy Publishing Company. ISBN 1-872895-58-1. Jackman, Mike (2006). Blackburn Rovers: An Illustrated History. The Breedon Books Publishing Company. ISBN 1-85983-475-2. Miller, Geo. C. (1992) . Blackburn: the Evolution of a Cotton Town (Limited second edition reprint ed.). Blackburn: T.H.C.L. Books. ISBN 0-948494-18-2. Taylor, Andrew (2000). 20th Century Blackburn. Wharncliffe Books. ISBN 1-871647-89-4. Timmins, Geoffrey (1993). Blackburn: A Pictorial History. Phillimore and Co. ISBN 0-85033-865-4. Turner, William (1992). RIOT! : The Story of the East Lancashire Loom-Breakers. Lancashire County Books. ISBN 1-871236-17-7. Wikimedia Commons has media related to Blackburn. Wikivoyage has a travel guide for Blackburn. Photographic history of Blackburn with Darwen as influenced by the development of the cotton trade.